These nutritionally deficient mutants, termed auxotrophs, will not grow on minimal medium, but they can grow on medium that contains the substance that they are no longer able to synthesize. Beadle and Tatum first irradiated spores of Neurospora to induce mutations (< Figure 15.2). After irradiation, each spore was placed into a different culture tube with complete medium (medium containing all the biological substances needed for growth (see Figure 15.2). Next, they transferred spores from each culture to tubes containing minimal medium. Fungi containing auxotrophic mutations grew on complete medium but would not grow on minimal medium, which allowed Beadle and Tatum to identify cultures that contained mutations. After they had determined that a particular culture had an auxotrophic mutation, Beadle and Tatum set out to determine the specific effect of the mutation. 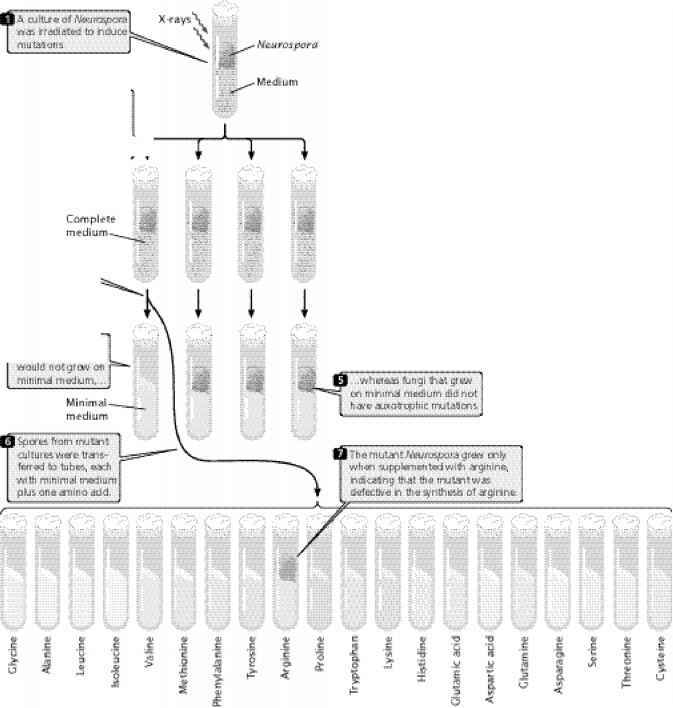 They transferred spores of each mutant strain from complete medium to a series of tubes (see Figure 15.2), each of which possessed minimal medium plus one of a variety of essential biological molecules, such as an amino acid. If the spores in a tube grew, Beadle and Tatum were able to identify the added substance as the biological molecule whose synthesis had been affected by the mutation. For example, an auxo-trophic mutant that would grow only on minimal medium to which arginine had been added must have possessed a mutation that disrupts the synthesis of arginine. Patient application of this procedure allowed the genetic dissection of multistep biochemical pathways. Adrian Srb and Norman H. Horowitz used this method to investigate genes that control arginine synthesis (< Figure 15.3). Oanchjiicdi: T herrjiuL:^ tdUld br dtiiL:ft.::J t:y liifi HJtirei ^: - liLy i*> iJfOw :"iILrI:I j! .11 cdi Jill ttlfiptemMtt:: J b> ttl£ tubsl. !MCt thiL th t lfiSfci lOUI . : nut it} i f. till Jt.